Opisthobranch of the Week is Stiliger sp. For a long time this spectacular species was listed as a Costasiella because the eye spots were close together. 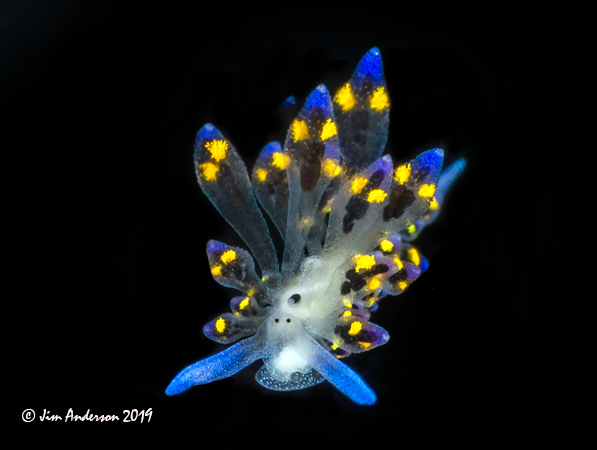 Nudibranchs and Sea Slugs (second edition) explains that it is a Stiliger, and because this group is not a natural group (Krug et al., 2015) will probably be synonymized with Placida in the near future. The animal is bluish in color. The cerata have a dark digestive gland and contain yellow and blue patches. The rhinophores, oral veil and tail are dusted with minute blue specks. Krug, P.J., Vendetti, J.E., Ellingson, H.A., Trowbridge, C.D., Hirano, Y.M., Trathen, D.Y., Rodriguez, A.K., Swennen, C., Wilson, N.G. & Valdes, A 2015. Species selection favors dispersive life histories in sea slugs, but higher per-offspring investment drives shifts to short-lived larvae. Systematic Biology 64: 983-999. Actually there was a prior sighting by Dave Cowdery at the 2016 SlugFest at Crystal Blue Resort! 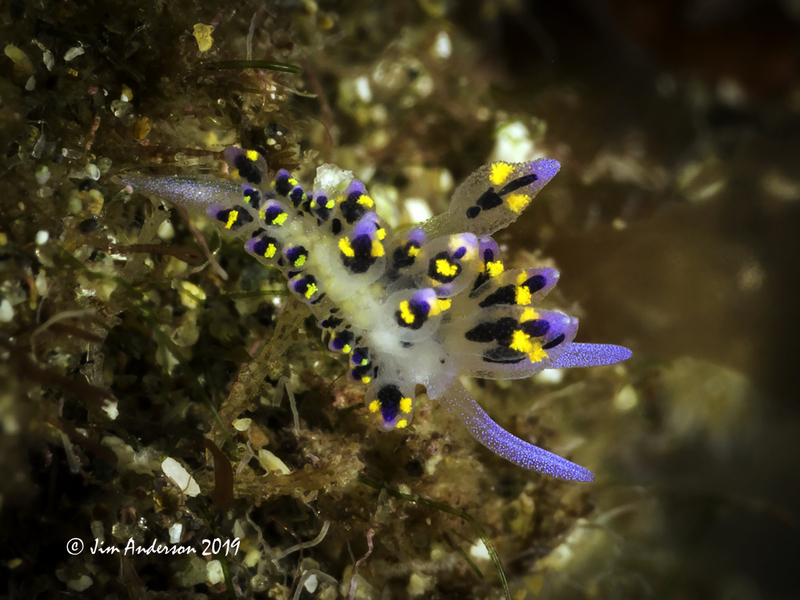 Please go to BOW 961 to see Dave's pic of this beautiful sea slug! Sorry Dave, the Webmaster went to sleep at the switch! An architect who retired from practice in 2011, Jim Anderson is fascinated by the incredibly colourful world that lies just a short distance from the shore around the coast of his home in Scotland. He learned to dive there and very quickly discovered the diversity and extravagance of life that the grey sea does well to disguise. Photography started as a means of recording these sights - to try in some way to let others into this wonderful new world that was opening up. 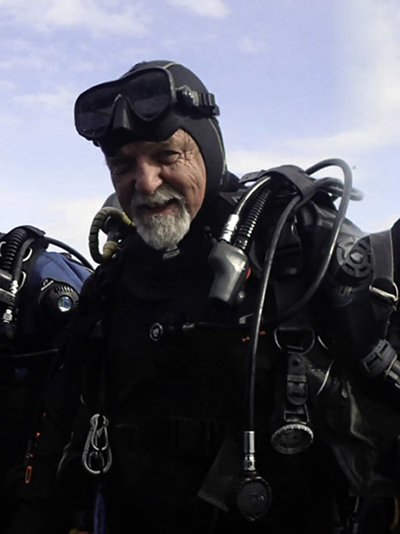 He commenced diving in 1987 and has recorded over 4000 dives, over 2200 around Scotland, mostly with a camera in hand and has developed special skills in capturing images that have been widely published in national diving publications and identification guides. He is the proprietor of nudibranch.org the portal to his extensive nudibranch and other web sites covering his home country and the destinations he has visited in the Philippines, Indonesia, Maldives, Red Sea, Kenya, Ireland and in the Caribbean. He is a 1st Class Examiner with the Scottish Sub Aqua Club and delivers Nudibranch Identification courses on behalf of the UK Marine Conservation Society." 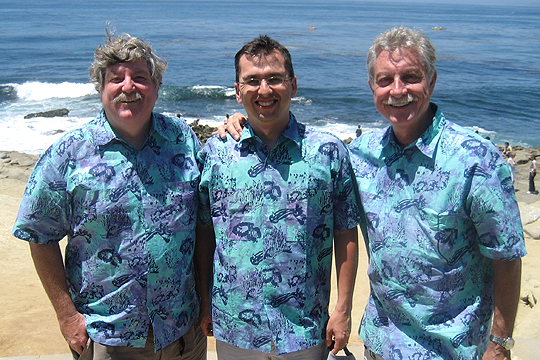 WEBMASTER'S NOTES: Jim is going to be a co-host to a Nudi Workshop at Crystal Blue Resort in 2020! This is one workshop you do not want to miss! For further details, please see the flyer!